With us today is our blog buddy Chrys Fey with a fun post on a....catfish! Welcome Chrys. Let's hear about that catfish. In 2008, Tropical Storm Fay hit Florida. She became the first storm in recorded history to make landfall in Florida four times! She released so much rain from her cloudy hands that the road and field across from my trailer flooded, making it look like I lived in the middle of a lake. I watched the water rise with growing anticipation. When the water lapped at the top step, I was afraid it would spill over and leak across my living room. While I nervously kept an eye on the water, a cat fish swam up to greet me. He hung out around my front steps for several minutes before swimming away. I remember hoping he’d find a lake or pond before the earth swallowed the rain, but it continued to rain for days. I was strained in my trailer for about a week, writing and suffering from cabin fever. Tropical Storm Fay (as well as Hurricane Francis) inspired Hurricane Crimes. She also had another impact on me. Shortly after she finally decided to leave I came up with the last name for my pen name: Fey. Although I chose it for its magical meaning, I still believe the storm gave my muse a nudge in the right direction. And that cat fish I saw later became the star of Seismic Crimes. Mosquitoes swarmed inside the car, attracted to the foot of murky water at the bottom. The hum of their music beat against her eardrums. She moved to the driver’s door and bent down to peer through the window. 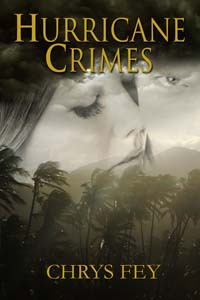 For a moment, she saw Donovan sitting there, his body hunched over the steering wheel. She nearly lifted her hands to bang on the window as she had done before, but she heard his voice behind her and knew the vision wasn’t real. When she blinked, her eyelids swiped the vision away like windshield wipers. Movement caught her attention. Cupping her hands against the glass, she saw ripples dance along the water’s surface. She squinted to see better and vaulted backward when something leapt out of the water, somersaulted in the air, and landed with a splash. A catfish had made Donovan’s car into a swimming pool. She couldn’t stop the laughter from bubbling out of her mouth. It does sound good. Thank you both - and drat you both. You know you should be worried when a catfish swims up to your door! Exactly. That's not a good sign. I had fish all over my yard one year when the river flooded. Yikes! I would've hated that cleanup. Ok..scary to know that you were so close to being flooded out but glad all that happened was meeting Mr. Catfish which inspired your book. Congrats on being showcased here and having your book recognized. I was worried about being flooded. But that catfish sure did inspire me. Thank you, Birgit! Taken a chance on YOUR RECOMMENDATIONS and bought them. AU$6.71 and $1.31. The prices won't send me to the poor house. Hi, again Chrys, and hello, Sandra! The terrible trio of Charley, Frances and Jeanne kept me hunkered down in Central Florida through much of the summer of 2004. As flood waters rose and my lawn turned into a lake, I kicked myself for making a wish that I would someday own waterfront property. 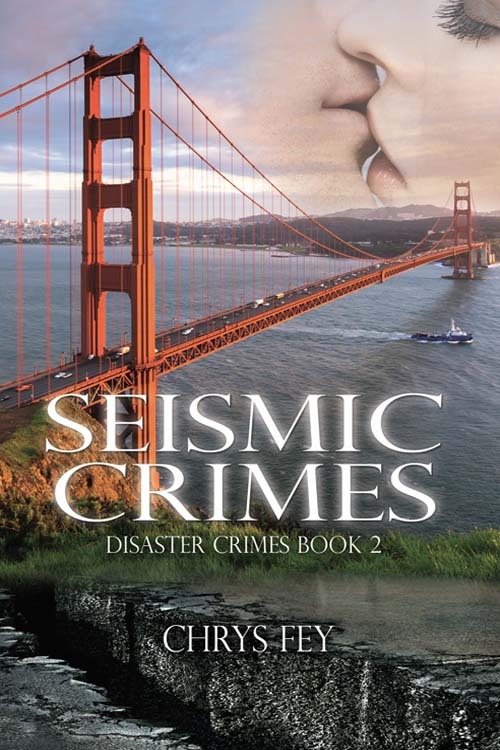 Drawing from her experiences, Chrys is well suited to explore the disaster crimes genre. I wish her success with her book series! Thank you, dear friend Sandra! Yes, those three hurricanes, especially Frances, inspired Hurricane Crimes. Thank you so much for the compliment, Shady. I rather enjoy writing about these disasters. That's the part about hurricanes most people don't know - the flooding they called. Relieved to hear you were only trapped and not flooded. The flooding can get really bad. lol who knew a catfish a knocking at the door could do so much. This reminds me that I need to purchase supplemental flood insurance. Ha! I'm glad I can remind you. My own heroine later has troubles with that. Right now my back yard and patio look a bit like Chrys' description of her own situation, even though my flooding is caused by excessive rain and hail. Sounds like this would make an excellent story because true life experiences interspersed with mystery makes for an excellent read. Excessive rain can sure bring in the floods. I hope the rain stops soon where you live. Thank you, Bleubeard and Elizabeth! Every year I pick up fish off the beach that have washed in over the winter and didn't get picked to pieces by the birds. But a hurricane? Yikes! It's sad how many fish are impacted by weather. theeze books sound total lee awesum....we will sneek over ta amazon while de food servizz gurlz at werk & chex em out !! Thank you,tabbies. Enjoy your weekend! Sounds interesting. The more I read about this book, more it intrigues me. Sounds good! I hope they reunite and find the killer! Thanks for sharing! Hugs! Very clever! I went through the big flood here in 2010 and I know that helplessness that comes when Mother Nature bears down on you and there's nothing you can do. That helplessness does not feel good. Thanks so much for sharing this, it sounds really intriguing.